Oh dear. I had so many beautiful screen captures that I did not get to share yesterday that I'm just popping them in today in no particular order and without much commentary so that they'll not go to waste. 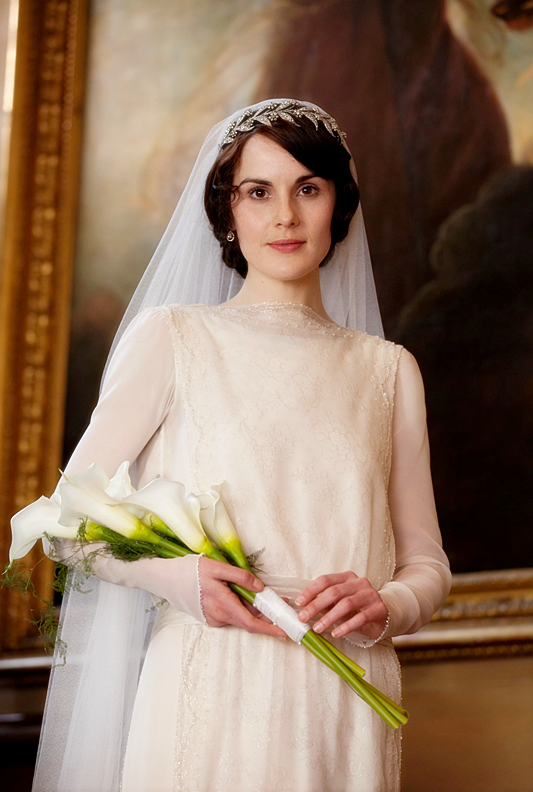 Do you have a favorite dress or outfit, from any season of Downton Abbey, that comes to mind? For me, it would be Mary's wedding dress. I had forgotten that she carried Calla Lilies. As lovely as the ladies are, for me, the best dressed are the homes.☺ This is Isobel's cottage where I could happily take up residence. I don't know what we'll do without Downton Abbey on Sunday nights, but I'm sure that we'll find something! Thanks for stopping in. Have a beautiful Thursday! Oh Vee, I loved Mary's wedding dress too! She just has the perfect figure to pull off any style; so statuesque. Oh, so fun that you have that jewelry! I have some from my grandma too. Maybe I'll post photos of it some day. So nice to see it, Vee! And one of my favorite dresses was Edith's green dress that she wore when she went to that club with Gregson. I think the cast called the dress 'Beadith.' It was gorgeous! I also loved, LOVED Mary's blue robe that she wore when she was pondering what to do with the King's Cross train ticket.Actually, I love most of Mary's clothes. They're beautiful. 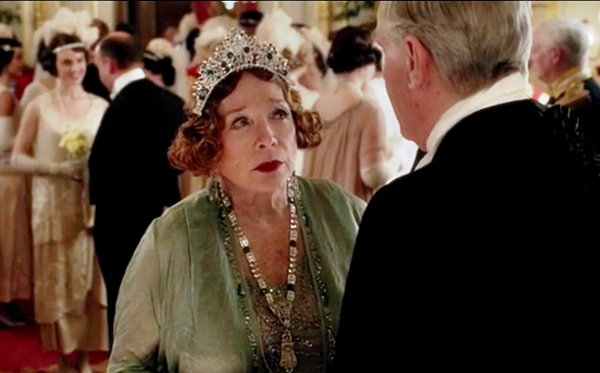 One of the truths we are reminded of through period shows like Downton is how everyone dressed up at least a little. I thought the servants on the beach looked nice! I recall my much older sisters from when I was a child (late 50s thru early 60s especially) and how they always looked so nice when they went out. 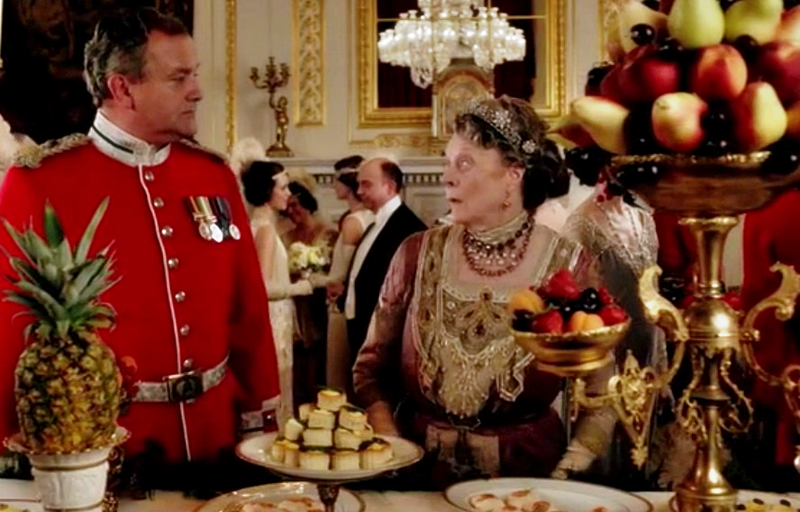 One of the reasons I like watching Downton so much is the clothing, table settings, décor. I will miss it. Loved seeing your family jewelry. 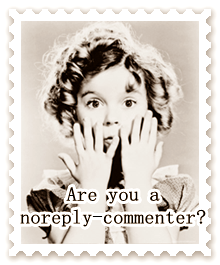 Lovely post Vee. 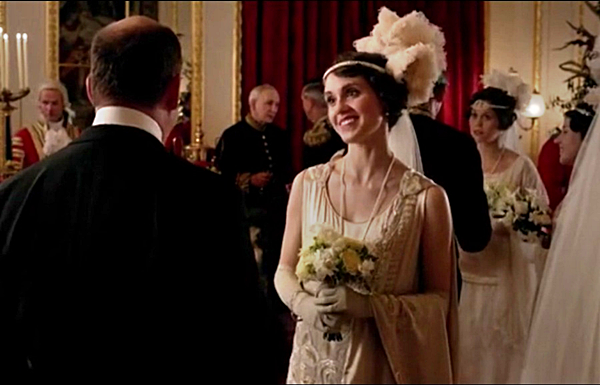 There is no doubt the dresses in the last episode of this season on Downton, were the most beautiful I have ever seen. I love the heirloom jewelry! I have a few pieces that would be interesting to share! 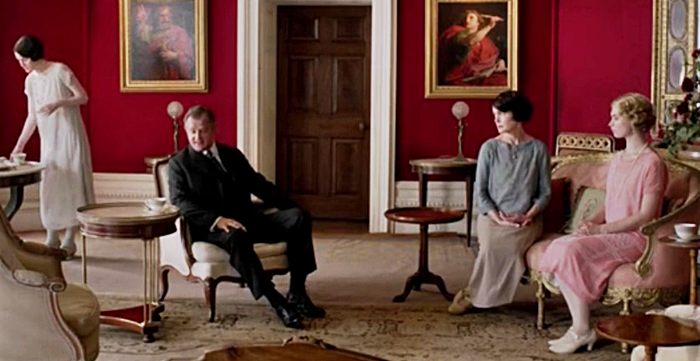 What shall we do without the peeking in on the lives of Downton? What lovely jewelry you have from that era! Yes, Sunday evenings will lack something special for a long time to come! I really love the clothes from this era. Beautiful design. Wonderful hats! Good morning! Definitely one of the best reasons for watching this show is feasting your eyes on all those GORGEOUS clothes. How I love it. And their table settings would be a close second, lol. Beautiful jewelry Vee! Enjoy your day! If they see your jewelry, they may want to use if for next season. The bird and nest are stunning! I love necklaces with a long chain...we really should wear some of our vintage jewelry. Thanks for mentioning me this morning! And for the added photos. Daisy looks as sweet as she is in this pink dress. I'm remembering a pretty sleeveless dress that Edith wore to meet her beau in the hotel restaurant. She said she really wanted to make an effort and looks as pretty as we've ever seen her. Enjoy your day my friend! Beautiful jewelry Vee- and I am always in awe of all the pretty dresses...I can't even single one out because they are all pretty stunning. That was such a lovely time for fashion. Thanks for more 'fashion shots' Vee - the dresses are beautiful so hard to choose one over another. As my mother was a Royal dressmaker in London, and made clothing for Queen Elizabeth the Queen Mother (present Queen's mum) including a hand-beaded gown for the Ascot Races one year, I loved seeing the work on Freda's gorgeous gown up close. Also, that entire article you linked us to was very interesting. Once again, it reinforces my thoughts on how good it was that 'David' abdicated. Britain was then graced with his brother George who overcame his speech impediment and, with the amazing Elizabeth at his side, made a truly wonderful King of the people bringing the country through WWII……….and beyond. Lovely jewels Vee - fabulous they have been kept in your family all those years - I know you treasure them. The jewelry is beautiful! I always find that even the costume jewelry from vintage times was more detailed and so much better quality than you can get today. I love the old stuff! I would have to say my favorite dress is the blue one Mary is wearing, love that shade of blue! I sighed with contentment when I saw that cottage scene and the climbing roses. The costumes in the production are terrific. I can't image how much time and effort is put into the whole endeavor! Love your family jewelry. Treasures, each and every one. I couldn't pick a favorite dress, they are all so beautiful with there embellishments! I was awed by Mary's periwinkle airy dress too. I had to zoom in on that unusual bird necklace to get a closer look! so unique. And what is the pretty box on a chain? Your very fortunate to have these heirlooms. I did see Diane's yesterday too. It is on a chain about six inches long total. It is a mirror and there's a small compartment for rouge. I was told that a woman would wear it at her waist. It belonged to my great-grandmother. The black beads were great-grandmother's mourning beads. The green necklace is actual jade. I'm not sure of the blue stones in the bird necklace. It is a pretty piece. From the the close-ups, I notice that they all need some cleaning. The only one I wear is my great-grandmother's locket with my grandmother's baby photo inside. I love your family jewelry! Thanks for sharing all these great photos of this great journey through Downton. Gorgeous jewelry! Wish I had some from that era! I think the blue dress Mary wore is a favorite. I really fell in love with it. I can't imagine having to wait a full year for more Downton! Sigh! The women of yesteryear had such pretty jewelry. I love vintage pieces. My mom disposed of many things i'd liked to have had in her early alzheimers before we realized what was happening. I did get back some family silver plate, but nothing else. You have some beautiful examples that I'm sure mean a lot to you. 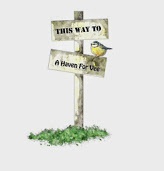 The English have one thing (actually more than one) that I love, and it is a love for gardens and lovely cottages. Tea time is a tradition I wish we had here. 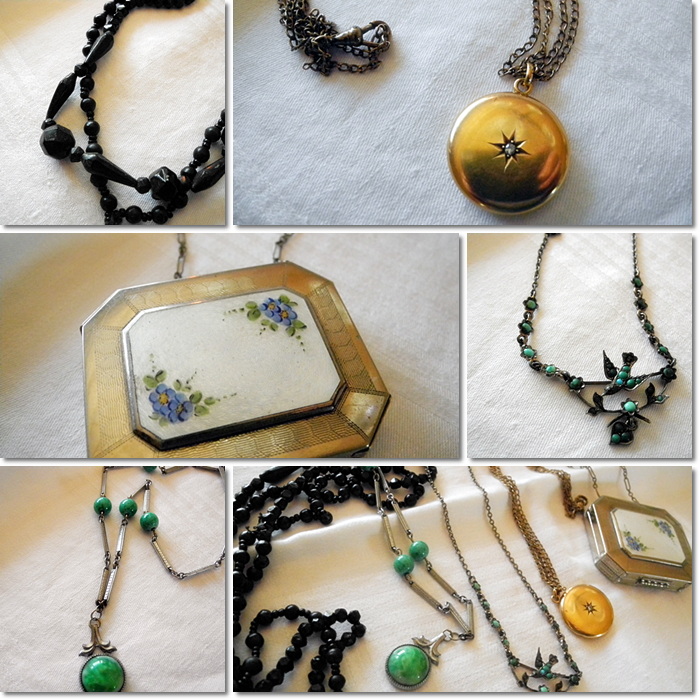 What fun to have those jewelery pieces from your grandmother and great grandmother. Very nice. I did enjoy the dresses except for Rose's ball gown. I thought those poochy flares at the hips were awful. Hope you have a lovely day, Vee. I'm the odd one here. I don't really like the fashion of this area. Most of the dresses look like sacks to me. But then I'm not much of a clothes person. : ) I do like the jewelry and looking at the home decor. And you could wear it so well! One has to be lean to get away with such fashion. Beautiful jewelry! The dresses are certainly gorgeous, although I always think the ladies look a bit chilly...lol! I don't do sleeveless because I am self-conscience of my fat arms....of course that is the "flapper" style that was 'in' back then :) I also love Violet's cottage...I even thought the cute little one the Bate's live in the village is sweet and cozy, although we only saw it when they were fixing it up last year. Thanks for sharing these extra shots, Vee! I see you don't to rush out to Macy's either to buy some period jewelry. I hope with the popularity of DA we can wear the pieces we have and not stand out as peculiar. More Downton! Lovely images you've captured, Vee. That dress of Freda's is a stunner; I clicked on the link and read the article, then linked to another article about DA and another, and so it goes. My favorite garment is a blue jacket that Mary wears in Season One and possibly Two. It has dark velvet lapels and is almost the same colour as the dress you've shown above. I love the cut of the jacket and the way it curves so beautifully. Another outfit I really like of Mary's is the pale grey dress and hat she wore when lunching with Tony Gillingham. I like the scenes of the smaller homes, too, probably because they are easier to relate to modern homes than the grandeur of DA. Grey stone and climbing roses are always a draw. How great that you have jewelry from that era, passed down through your family. Thank you for sharing it with us. Well OK, you are inspiring me to post my collection of 1910-1930s era hand sewn lingerie again. The show's costumes should be put together in a traveling show. I know many museums that feature historical costumes and since most of the women's costumes were from historical collections (or so I have been told...) I think it would be fabulous to allow the costumes to be shown around the UK and N. America. PS: My grandmother had forget me not jewelry from the 1910-1920 that my mom now owns. Lovely family pieces you have there. I like that you share those screen shots with us. Each one is a thing of beauty. There's so much to see in each quickly passing scene so it's nice to be able to linger a bit and enjoy with what you share. Thank you for sharing more pictures. Daisy looks so sweet in that pink dress. I think I watch Downton Abbey as much for the set and costumes as for the story line. Your bird necklace is very pretty Vee. The pictures are wonderful!! You are very fortunate to have some jewelry from your grandmother. It is lovely. I love that cottage, too! What wonderful treasures your grandmother's jewelry are. By the way, I just noticed the little up-arrow at the bottom of your page. How did you do that? The photos are beautiful, even for a nonwatcher. As for the jewelry? I love it. I have a great fondness for period jewelry from most periods, that one in particular. I am going to get busy and catch up on DA. I must be the only one who has not ever watched. The clothes, hairstyles etc. are gorgeous. What special and beautiful jewelry you have shared, Vee. Wishing you and John a good night and a happy weekend. Lovely. The clothes, the jewellery, the homes and decor. It's all lovely. And so is your family jewellery. What wonderful treasures to have. Thanks for sharing. I hope I get around to watching the rest of the episodes. Lovely screen shots Vee. I am amazed at your jewellery from that era and Jill's lingerie. I am wondering now if I own anything from that era. Such treasures. I missed this post yesterday, Vee. Gorgeous. I don't think I have a favorite dress. I love them all. It is fun to see them move forward through time and the skirt lengths change along with the way the dresses are formed to the body or free flowing. It's really a wonderful history of fashion as well as a story line. What wonderful treasures to have jewelry that belonged to your grandmother and great grandmother! 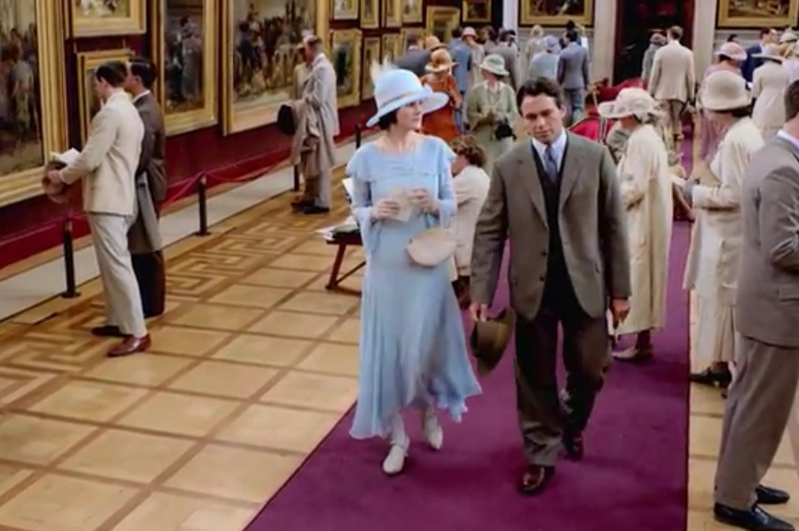 I loved Mary's light blue dress and hat. I also like the scarlet colored dress she wore a few times lately. Out community is having a one hundred year celebration in late summer of when this area was named for the ranch that was established back then. We all have to dress as if it were 1914 for the celebration. I'm not too sure I can pull that off! I'm afraid I will look pretty dowdy as I don't have the figure for dresses like these...lol! Guess what--the committee asked V to be Teddy Roosevelt for the day--everyone thought he looked like him--lol!